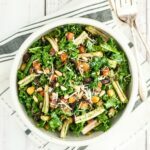 This kale pesto salad is a hearty, comforting, one-bowl meal that is packed with healthy ingredients and delicious flavors. Plus, you can make the pesto and the salad ahead of time so it’s ready to dish up and eat even on busy days! Spring food!! Not only is it colorful, it’s also popping with fresh flavors that have been hibernating all winter. 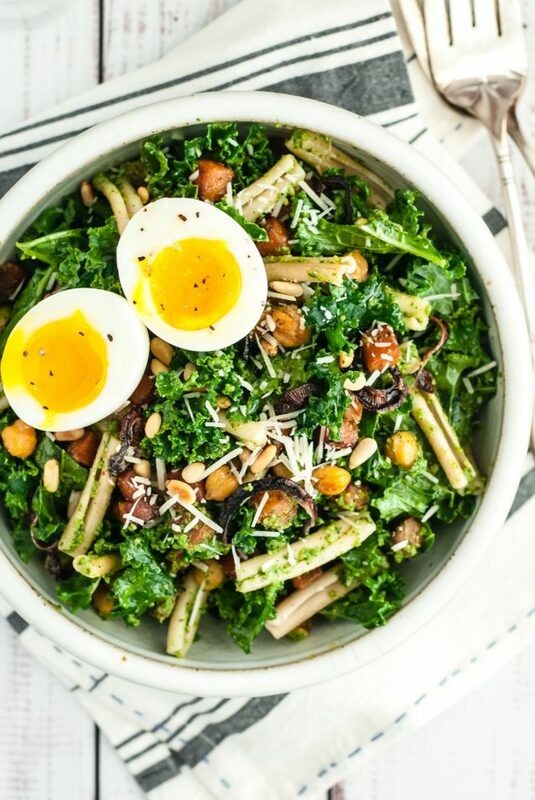 This kale pesto salad is no exception. I love this dish for a spring time lunch or a hearty side dish for dinner. I’ve even added twice the amount of pasta to turn it into an incredible dish to bring to spring or summer cookout with friends. Don’t let the abundance of green trick you into thinking this isn’t kid-friendly. Both my girls happily ate this for dinner, though I will admit Kaitlyn was most enthusiastic about the noodles (but… the noodles that were coated in kale!). To make things even more convenient, the pesto (or the whole salad if you prefer) can be made ahead of time. The flavors blend well overnight- just give it a few good stirs before serving. Also, if you want to make it vegan, check out the recipe notes! Combine all ingredients in the container of a blender or food processor. Pulse until smooth. Store in refrigerator for up to 2 weeks. Spread butternut squash, chickpeas, and onion rings onto a large rimmed baking sheet drizzled with 2 tablespoons olive oil. Roast at 425° for 20 minutes, stirring gently halfway through cook time, or until lightly browned and roasted. Remove and let cool. 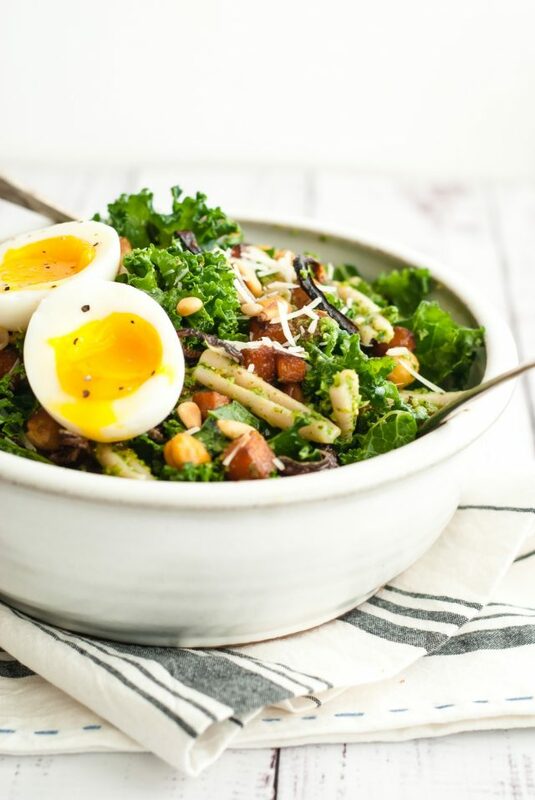 Combine torn kale, pasta, pine nuts, butternut squash, chickpeas, and onion rings in a large bowl. Add Kale Pesto and gently toss to cover salad. Top with Soft Boiled Eggs and extra Parmesan. Make the pesto the day before to save time. Heat it for 10 seconds in the microwave to loosen it up before stirring into the salad. Look in your produce section for a package of already cubed butternut squash for a real time-saver. To make the perfect soft-boiled egg: Bring water to a boil. Gently lower eggs into boiling water. Allow eggs to boil for exactly 6 1/2 minutes. Remove eggs from boiling water directly into a bowl of ice water. Let eggs sit in water for 10 minutes. Peel and enjoy. *Store in fridge for up to a week. Flavors really marry and mellow after chilling in fridge for a day! To make Pesto Vegan: Increase pine nuts to 1 cup. Add 2 tablespoons nutritional yeast. Omit Parmesan cheese. 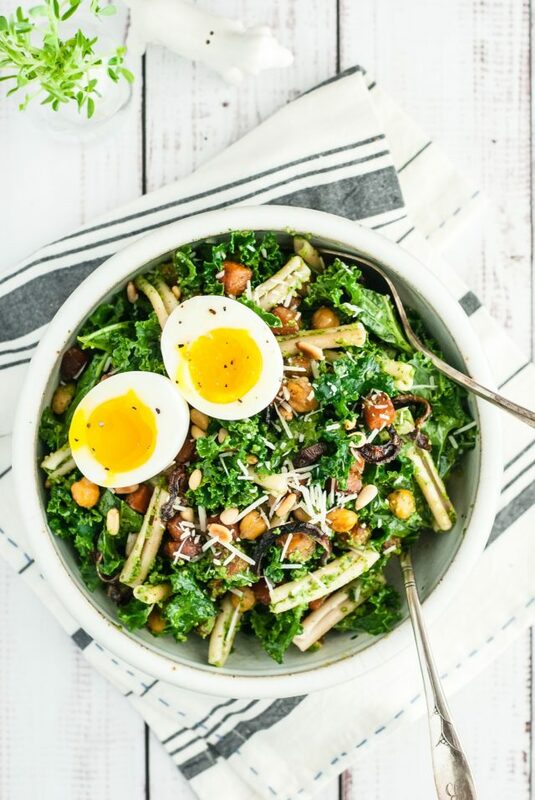 To make salad Vegan: Use Vegan Pesto and omit egg and Parmesan on salad. I also had success this week roasting butternut squash from frozen! A great time-saver if you can find pre-cut butternut squash in the frozen section of your grocery store.